Mission 22 will be here soon! This latest Parachute Mobile mission will coincide with ARRL’s Pacific Division Ham Radio Convention, PACIFICON, www.pacificon.org. We will have a Pacificon information table located in the outer hallway of the San Ramon Marriott where you can learn all about what Parachute Mobile is and what we’ve been doing behind the scenes to make these events fun. We will also have monitors where you can view live streaming video from the Drop Zone, located at the Byron Airport, as well as 5 GHz ATV air to ground video from Jumper 2. We hope to have our first jump underway somewhere around 10:00 A.M and further jumps every 60 to 90 minutes thereafter. Unfortunately, we have no control over the aircraft and sometimes there are shutdown delays when minimum jumper count has not been met for a load. On occasion, Mother Nature plays her hand, and if winds are too high we may have to scrub the mission. Watch our website for updates. On the day of the event, announcements and status reports will be made on the W6CX repeater located on Mount Diablo at 146.070 + 100. If you are at Pacificon, come by the table and check the updates on the ETJ (Estimated Time of Jump) board. Just prior to each jump you will want to switch over to 146.430 MHz simplex to make your QSO. The Jumpers exit the King Air 90 jumpship at 13,500 feet, freefall for a few seconds to get a stable position for canopy deployment , then open their parachutes so that they can get the longest hang-time possible for QSOs during descent. There will be HF jumps for this mission. Expect at least one jump to have comms on 10 meters at 28.425 MHZ USB. On subsequent jumps we may move to another HF band so listen and check our website for updates. When possible, depending on payload profiles, the jumpers will be equipped with APRS. 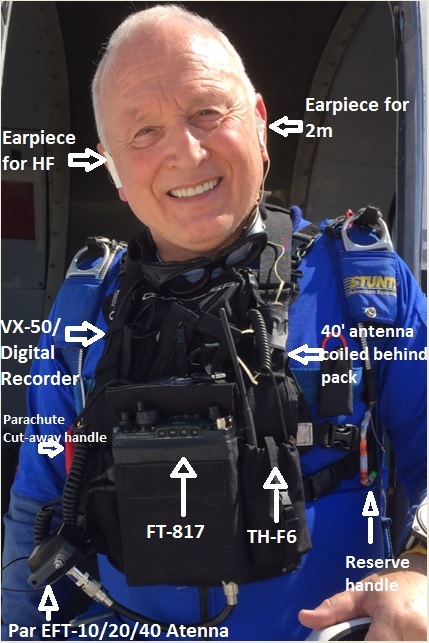 Our newest jumper Rob Fenn, KC6TYD, Jumper 3, will be making radio jumps with us on Oct 17th. Rob, our team leader, joined as a non jumping ham. 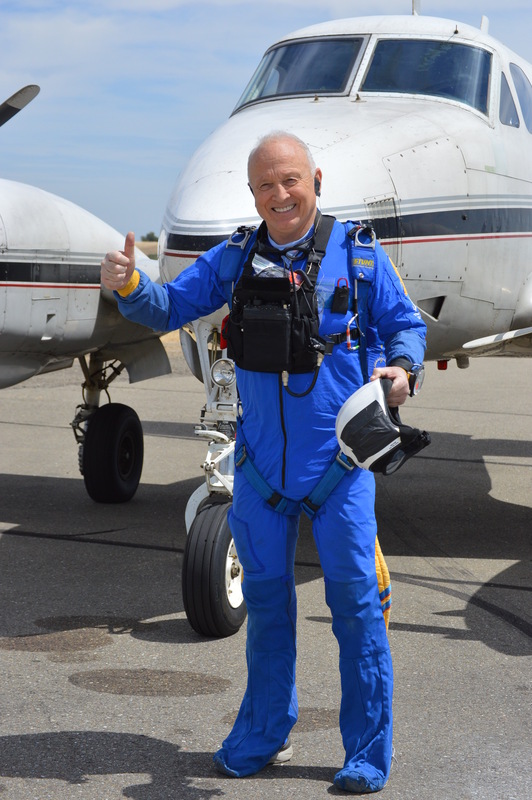 He took an immediate interest in skydiving, got trained and licensed, and now has 100 jumps in his log! What’s cool about our APRS data is that you will see biotelemetry. The jumper’s heart rate and blood oxygen saturation (SpO2) will be displayed. As always, make a QSO with a jumper and receive a one-of-a-kind QSL card. Since our jumpers have no practical way of manually logging their calls during their descent, we rely on audio recordings taken during each jump. Unfortunately, we still get busted calls. If you make a contact let us know by emailing kc6tyd@gmail.com. To find out how Parachute Mobile got started, click on the About Parachute Mobile tab at the top of the webpage. In the air-On the air, PARACHUTE MOBILE. Pics showing radio gear mounting details on AF6IM. 3 ham parachutists AF6IM, KF6WRW and KC6TYD made 5 radio jumps on Sept 17th in conjunction with ARRL PACIFICON conference. Bands and modes were 10 M SSB, 2M FM, 440 DSTAR via WW6BAY repeater. Contacts were made on all the foregoing bands and modes. Parachute Mobile DSTAR contacts with Japan added to the fun. Jumpship was a totally stripped out King Air C 90, no pressurization, AC, heat, anti ice etc. Not even a door. Every pound saved means more jumper payload and more revenue. Note trailing wire antenna for HF. Dude, be careful. Remember, it's just a hobby. AF6IM cloud cruising while working 10M SSB QSOs Oct 17 2015. Good point and I do think about it. We focus on safety during Parachute Mobile ops, but no denying the risk. We do a lot of inspecting and rechecking to be sure that the radio gear will not interfere with the safe operation of our parachute gear. We use lengthy written checklists which regular jumpers do not. A power or antenna wire looped though the wrong place could be dangerous or even fatal. I actually worry more about the plane ride than the jump. Jumpships are typically old aircraft, maintained on a tight budget and very heavily loaded. Licensed experienced jumpers only pay $24 to go to 14,500 feet in a King Air 90 at my DZ. Not much profit if any on us. The DZ owner probably only profits on tandem jumps. .
Been jumping 47 years. So far so good. Had only two cutaways from malfunctioning main chutes in over 850 jumps. Nice to always have a plan B (reserve chute). I'm a paraglider pilot, and I often get on the local 2m repeater aero-mobile, but never get any takers... so good on ya getting a group going and raking up some followers! What fun! Too bad you are so far away. 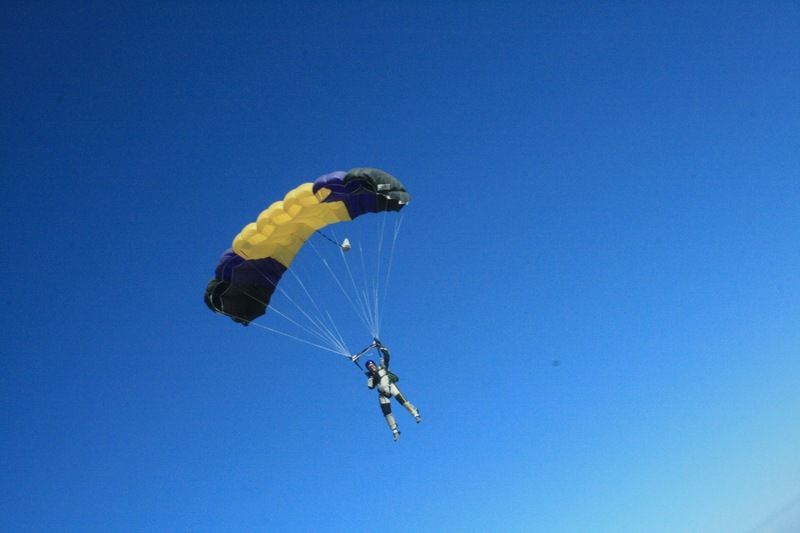 A parachute to paraglider QSO would be very unique and fun. Jim Wilson, one of our team members who is a licensed rigger, is working on a paraglider that can be deployed jumping from an aircraft. It can't take a terminal velocity opening but he has done several successful sub terminal deployments. He set a Canadian parachute distance record using a custom canopy that looks like a cross between a skydiving canopy and paraglider, about 18 miles as I recall. We descend about 1000 feet per min under an open skydiving canopy with a wing loading of about 1.2 lbs per sq ft. Would be nice to have much longer hang times for ham QSOs. Yeaaaah buddy, I'd be into that! What good fun doing a unique thing! You'll have a dinner-plate grin on the whole way down! There are some good vids on youtube of paragliders de-bagging from balloons real real high up. Usually the purpose is to stunt their wheels off the whole way down, all anyone is going to hear on the mic is "OMG.. arrrrggghhh.. jays..."
You're in the balloon for a while going up, as well as the long ride down. Even a Tandem ride down would be feasible. Have you thought about some 802.11n wireless, and a Full-HD or maybe a 4K live stream? Use a panel antenna under the pilot, and a 400mm dish on the ground. Cool fun, man! Wish I was there! So far our best live video is NTSC over 5 GHz ATV. We've tried 440 MHz, 1.2 MHz 2.4 GHz and now 5 GHz ATV. Digital video is still beyond our means. We can record 4K video aloft but we are far from being able to send it live to the ground. Mike K6MFW is our Parachute Mobile video guru and knows FAR more about this than I do. Hopefully he will chime in. I used to watch balloon lifted hang gliders do destructive flight testing above our Pope Valley DZ back in the stone age. They'd cut loose and wring em out usually until something broke. Then a cutaway and a parachute for the pilot. We haven't given much thought on these as simply doing basic air-to-ground is very difficult. You would think it is straightforward but something that is lightweight, durable, minimal use (jumper has a enough to deal with), and plus all the unexpected situations that occur in the field. First is to simply get live video from the jumper in the air to the ground. From 13000 feet that is little more than 2 miles, actually more because exit may not be exactly straight above our receiving station. Jumper equipment has to deal with "hurricane winds" during aircraft exit around 100 mph. Then have something jumper doesn't have to futz with (activating camera, focus, managing cables). And as Mark stresses the most, is all this absolutely must not get in the way of safe parachute deployment also not interfere if jumper needs to cutaway and deploy reserve canopy. Though new digital stuff would seem much better, it is much more complex. NTSC analog is durable and fault tolerant. First is camera, from my experience finding a good small camera with a realtime video output is pretty difficult. These small surveillance cameras have terrible picture, there are excellent cameras but they only can record. I find only the GoPro camera has excellent quality (fixed focus and zoom made specifically for the sporting person who doesn't need to constantly make adjustments to camera), and ***has realtime video output***. Then there is the transmitter. I've tried UHF equipment but it is either too weak RF power or too bulky for the jumper (already has a radio pack to deal with). The Comtech and Mobicomm boards seem OK, I managed to get one to do excellent video but that happened only once. Most of the time they don't work (loose connections develop or it seems RF power output is not what it used to be). RC/drone hobby market has recently developed and sold video transmitters that adapt to our needs (small, easy to use, low cost). From my experience, transmitting live video from a distance is not often done (nowadays it seems most frequent are the drone hobbyists flying their quads around), most people record and view later. There are cellphones that have streaming apps but have to go through a subscriber service. There are others like Felix Bamgartner that did superb video from 130,000 feet but RedBull provided the tens of millions of dollars in equipment and infrastructure (we are all common folk with day jobs that have to buy or build our own stuff). Then there is streaming. From my experience I have met only three people that can do streaming. Everyone else has their company person do it. These three are Michael KF6WRW who introduced me to streaming, Michael Carter of Paradigm Digital (he does live streaming of the ballroom dance sport competitions), and another at work who assembled live streaming for his church. Of course I don't have large sums of money so I use lowcost equipment for streaming. Another key item is KF6WRW provides a hotspot, another detail not many others can provide unless you want a whopping phone bill. And having the throughput is another obstacle, especially with data caps and throttling issues. It can be frustrating but damn when the video is good, I feel like I'm King of the World! Tried to work Japan on 10M SSB QRP but propagation wasnt good on Oct 17th. We tried UHF DSTAR on a subsequent Oct 17th jump and made contacts in Japan. Used the WW6BAY DSTAR repeater.